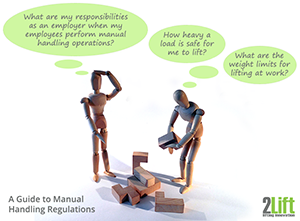 If you're an employer in Canada and are on the lookout for information on manual handling regulations, and how much you may safely lift and be manually moving and handling at work, you've come to the right place. Fortunately there is plenty of state official material available to you, and our purpose here is to give you an overview of what is out there online, and to help guide to where you need to go to get the information that you need. A quick introduction to the main authority for safety and health (and manual handling) in Canada. An insight into the main legislative obligations you have as employer in Canada if your workers are manually moving and handling loads. Ergonomic guidelines to safe lifting. Maximum weight limits for lifting, and links out to ergonomic risk assessment tools for lifting. 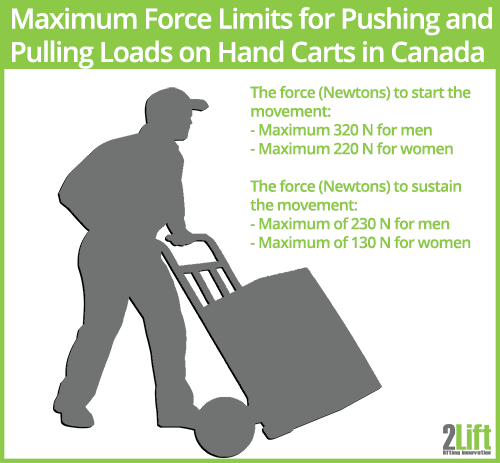 Maximum force limits for safe pushing and pulling of hand carts. 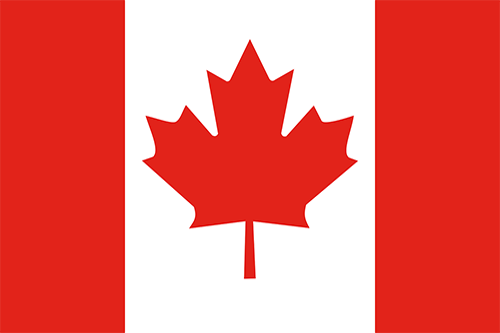 In Canada the federal department corporation, CCOHS, Canadian Centre for Occupational Health and Safety / CCHST Centre canadien d'hygiène et de sécurité au travail is the main Canadian authority for promoting workplace health and safety. CCOHS / CCHST works to improve workers' safety and health and thus to prevent work-related accidents, injuries and ill-health. They do this by providing a wide range of services and methods to help organizations raise their awareness of safety and health in general, assess hazard risks in the workplace and implement various programs of prevention. 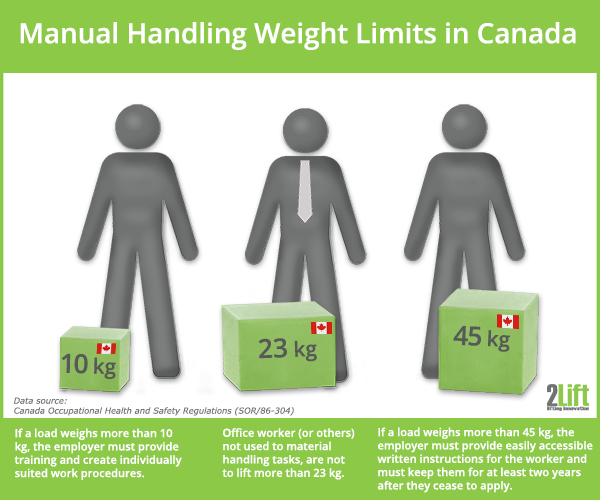 In Canada, regulations regarding the manual handling of loads can be found in Canadian law - more precisely in federal acts which are laws passed by the Parliament of Canada. If you need to go through the Canadian legislation on manual handling, you need to find what is called, Canada Occupational Health and Safety Regulations (SOR/86-304). In this section you can read about employers' responsibilities to ensure the safety and health of his / her workers. If the manual handling of material for any reason whatsoever pose a threat to the health and safety of the workers, the manual handling of loads should be avoided if possible. The employer must calculate the risks of the manual handling operation with special focus on the frequency and duration of the lifting operation and the terrain on which it is performed. Take into account the worker's individual capabilities and health as well as work environment conditions. The employer must keep this for at least two years after they cease to apply. The government department Employment and Social Development Canada (Human Resources and Social Development Canada) / Emploi et Développement social Canada (Ressources humaines et Développemnet social Canada) has created an easy-to-read ergonomic guideline, Protect Your Back!, to help guide employers install safe moving and handling operations at work. The aim of this guide to manual handling is reduce the number of low back injuries (LBI) and MSDs (musculoskeletal disorder symptoms) from manual handling by raising awareness of the risks of manual handling and by providing easy steps to follow in order to lift and carry in a safe and healthy manner. Avoid lifting operations that put too much pressure on you back! Don't lift more than 23 kg if you're not used to the effort and stress such a task will put on your body. If the load is too heavy, don't do it, ask for assistance. Don't think yourself stronger than you are. If possible, eliminate all repetitive lifting operations. Use mechanical moving and handling equipment. Reduce the weight of the load. Use correct lifting techniques and avoid risky postures. Use appropriate protective equipment and make sure that the load has a good hand grip. Conveyors app. 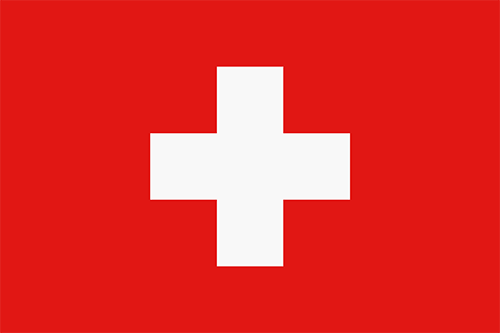 100 cm (waist area). Lifting and releasing loads at at least 50 cm from floor level. Top height for shelving should be a maximum of 175 cm. 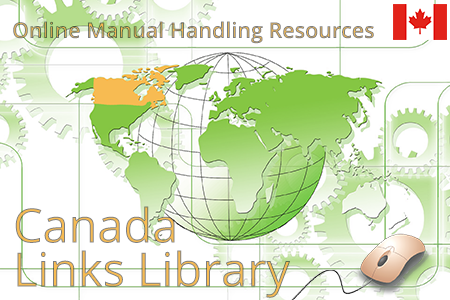 If you're looking for the specific ergonomic guidelines for the manual handling of certain loads (how to lift and carry safely), you can visit this page on Manual Material Handling from CCOHS. 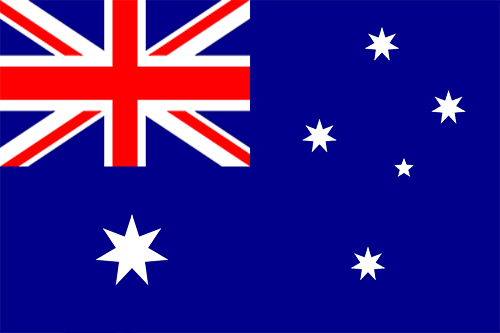 As mentioned, it is the employer's responsibility to identify hazards at the workplace and carry out risk assessment to analyse them and then work to eliminate or reduce them. CCOHS has created an risk assessment template as a sample - meaning that you need to customize it so it fits your needs. 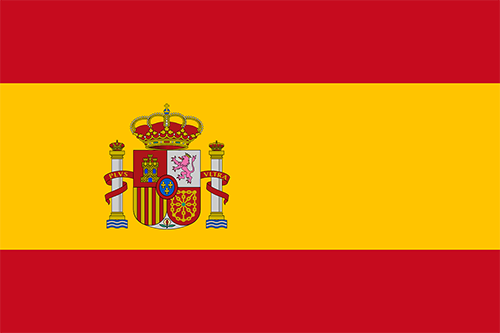 You can find the risk assessment here in English and here in French. This risk assessment is not specifically focused on manual handling. It is general in nature. It will help you to, among other things, identify the hazard, list its possible consequences, and come up with measures to eliminate or reduce the risk. If you want a very simple risk assessment sheet specifically for the manual handling of loads, this one, Ergonomics Guidelines for Manual Handling made by WorkSafe NB, may be of inspiration. 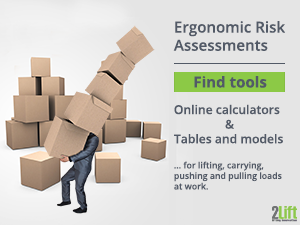 You will find the ergonomic risk assessment tool for moving and handling loads (both for lifting, pushing and pulling) on page 6 (they call it Manual Handling Checklist). The sheet is divided into three overall sections with questions addressing forceful exertions, posture and repetition. On the CCOHS website you'll also find information on and a calculator for using the (revised) NIOSH Lifting Equation. Even though the answers you get sound simple enough, using the lifting equation in its entirety is unfortunately not that simple. You need to know everything about the lifting task down to the tiniest detail, and to not be too scared of numbers. 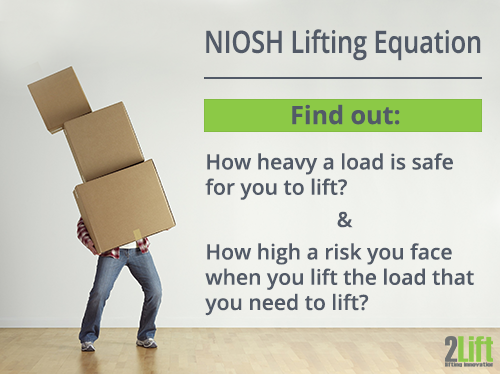 You will find CCOHS' NIOSH Lifting Equation calculator here. If you want a simplified, more employer-friendly version of the NIOSH Lifting Equation calculator, you might find the Oregon OSHA Lifting Calculator useful. WorkSafe BC (The Workers' Compensation Board of British Columbia), has also created a very simple lifting calculator to help employers find out how much of a risk a certain lifting task poses for the worker. As a result of the calculator, you get the maximum recommended weight limit for your lifting task (thus you can also see if your current load is too heavy for moving and handling). This lifting calculator is based on the joint Oregon OSHA/Washington State Department lifting calculator, and incorporates elements from the NIOSH Lifting Equation and ACGIH Lifting TLV. Pushing and pulling with hand above shoulder height or below the waist level. Pushing and pulling with force for more than 5 seconds. Pushing and pulling at an angle that is not straight in front of the body. On the same page you'll find the maximum recommended horizontal and vertical force limits for pushing and pulling. Maximum of 130 N for women. Furthermore a usage of 200 times a day for a hand cart is the maximum recommended amount. And 30-35 meters is the maximum recommended transport length per transportation. 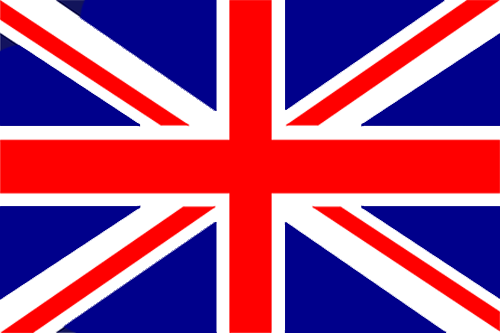 This page contains reproduced information created by the Government of Canada which is protected under Crown Copyright (Her Majesty the Queen in Right of Canada). 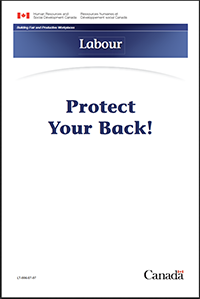 This notice applies to the illustration of the publication: Protect Your Back! 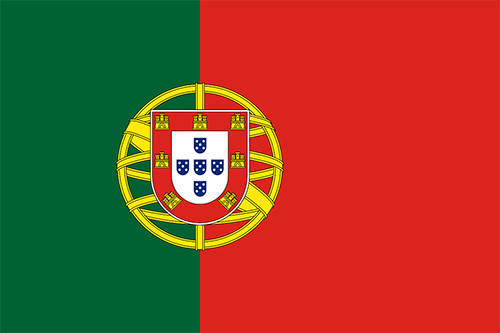 by the government department Employment and Social Development Canada (Human Resources and Social Development Canada). This reproduction is a copy of an official work that is published by the Government of Canada and the reproduction has not been produced in affiliation with, or with the endorsement of the Government of Canada. 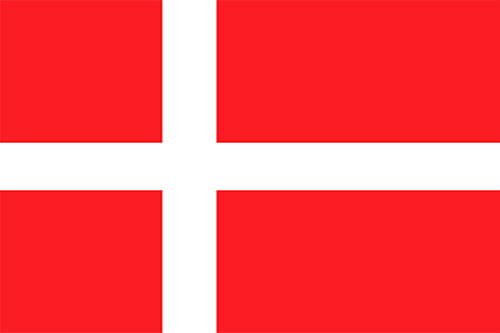 We have done our very best to ensure the accuracy and reliability of the information presented on this page. 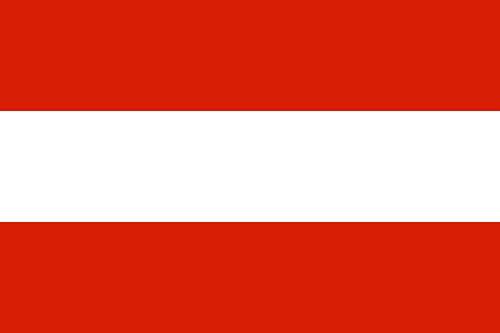 However, we cannot guarantee the correctness of any information (regulations change from time to time, responsibilities change hands, etc.). 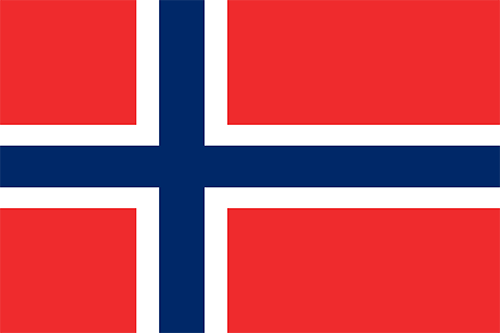 Thus we cannot accept any responsibility or liability for the accuracy, content, completeness, legality, or reliability of the information provided here. 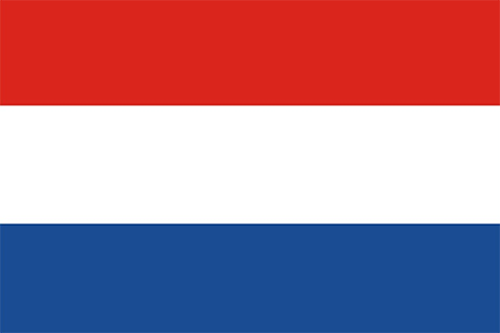 If, however, you are aware of any outdated or incorrect information on this page, you are very welcome to contact us, so we can bring our page up to date. 2Lift designs, manufactures, and delivers high quality industrial material handling equipment to international markets.